Which Of These Games Is Credited With Defining The PC Adventure Gaming/RPG Genre? "Blood Rain", Described By Multiple Accounts Throughout History Isn't Tinted With Blood, But? 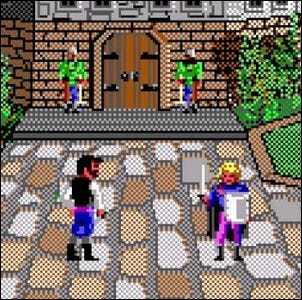 In 1989, Sierra On-Line released an adventure/role-playing game hybrid called Hero’s Quest: So You Want To Be A Hero? that saw immediate success and left a defining mark on the history of PC adventure gaming. The name itself was short lived, however, since HeroQuest was a trademark of Milton Bradley’s for a modular board game they produced. They sued to retain control of the trademarked name and Hero’s Quest was rebranded as Quest for Glory, but the game and the mechanics it introduced lived on. One of the key elements of Hero’s Quest, the critical genre-defining element if you will, is that it combined elements of the already well established adventure gaming genre and elements of role-playing games (RPGs). You weren’t just moving your avatar around in time and space within the game, pursuing your goals—you were also leveling up your character as you went. In the screenshot shown here (complete with authentic low resolution EGA graphics), you can see one such aspect of the RPG-incorporation: training with a sword master to level up your swordsmanship skills. To a modern gamer, the idea of working (and even “grinding”) in a game to level up your character feels like a trope as old as time. Hero’s Quest introduced that concept to PC gamers in a way that hadn’t been used before, however, and the fusion of RPG-style level advancement and adventure gaming was a smash hit. The game was critically acclaimed at the time of its release and sold 250,000 copies during its initial years on the market, spawned multiple sequels, a remake (in 1992 to update the game to VGA graphics and integrate a point-and-click interface), and defined the vibe of the new genre it more or less created: adventure RPG PC games. Image courtesy of Sierra On-Line.